FMDA – is the official state chapter of AMDA – The Society for Post-Acute & Long Term Care Medicine, and a Specialty Society of the Florida Medical Association. It is based in West Palm Beach, Florida. 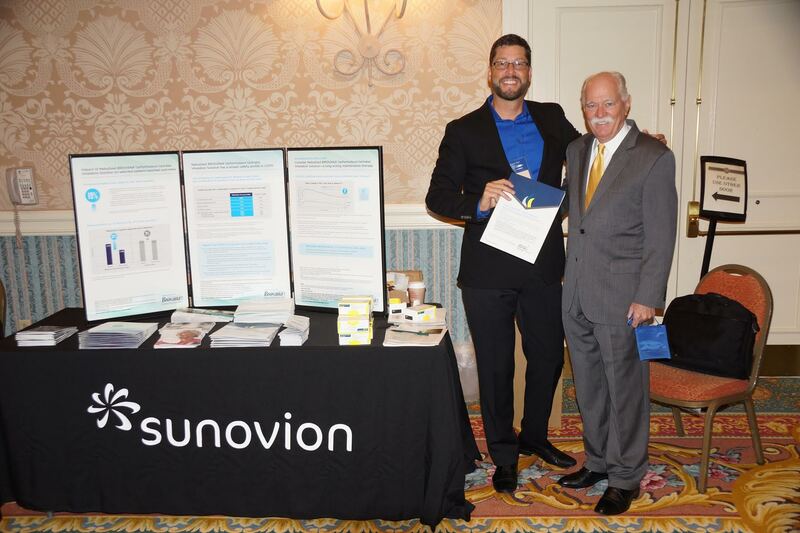 FMDA represents nearly 250 medical directors, attending physicians, physician assistants, and advanced registered nurse practitioners in Florida’s postacute care continuum including subacute care, hospice, skilled nursing, and assisted living facilities, as well as in continuing care retirement communities. The mission of FMDA is to promote the highest quality care as patients’ transition through the long term care continuum. FMDA is dedicated to providing leadership, professional education and advocacy for the inter-professional team. Florida Chapters – Gerontological Advanced Practice Nurses Association (FL-GAPNA) GAPNA was founded in 1981, by a small group of GNPs with the intention of offering the first continuing education conferences designed specifically to meet the needs of advanced practice nurses. Currently, GAPNA represents nearly 10,000 certified advanced practice nurses who work with older adults in a wide variety of practice settings. GAPNA is the organization of choice for advanced practice nurses who want to pursue continuing education in gerontological care and who seek peer support from experienced clinicians. The FL-GAPNA Chapter and the Florida Gulf Coast Chapters both operate in the state of Florida. 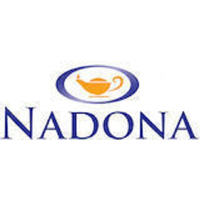 National Association Directors of Nursing Administration (NADONA) Since 1986, NADONA has been the leading advocate and educational organization for DONs, A DONs and RNs in Long-Term Care (LTC). NADONA/LTC was founded by dedicated LTC professionals, and its board of trustees still consists of LTC professionals. NADONA understands daily challenges, and are here to provide nurses with the tools they need for professional success. The program is designed to provide a review and update if major PA/LTC and geriatric diseases, illnesses, and risks found in nursing home patients, residents of assisted living facilities, those under hospice care, and senior living at home. FMDA is hosting its 15th Annual Poster Session during the Best Care Practices Conference, Oct. 11-14, 2018. The first 10 applicants who are accepted by the review committee will receive complimentary registration to the 2018 conference (only one applicant per poster presentation will be considered). 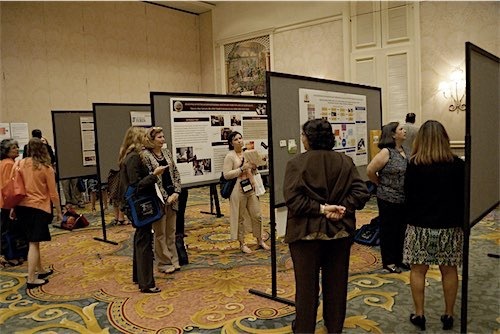 Poster sessions provide an opportunity for physicians, pharmacists, advanced practice nurses, and physicians assistants to share the results of research, best practices, and outcomes with colleagues. The sessions are visual presentations using diagrams, charts, and figures. 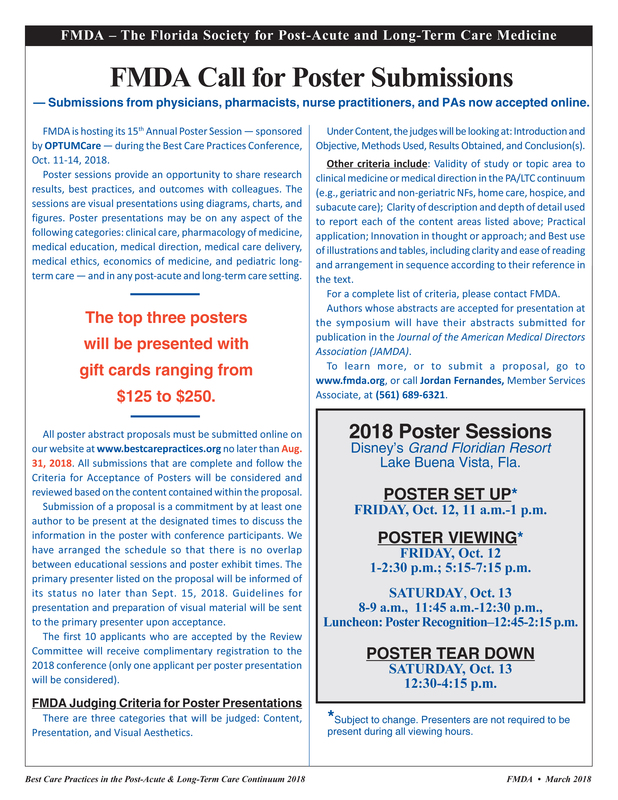 Poster presentations may be on any aspect of the following categories: clinical care, pharmacology of medicine, medical education, history of medicine, medical direction, medical care delivery, medical ethics, economics of medicine, and pediatric long-term care — and in any post-acute and long-term care setting. 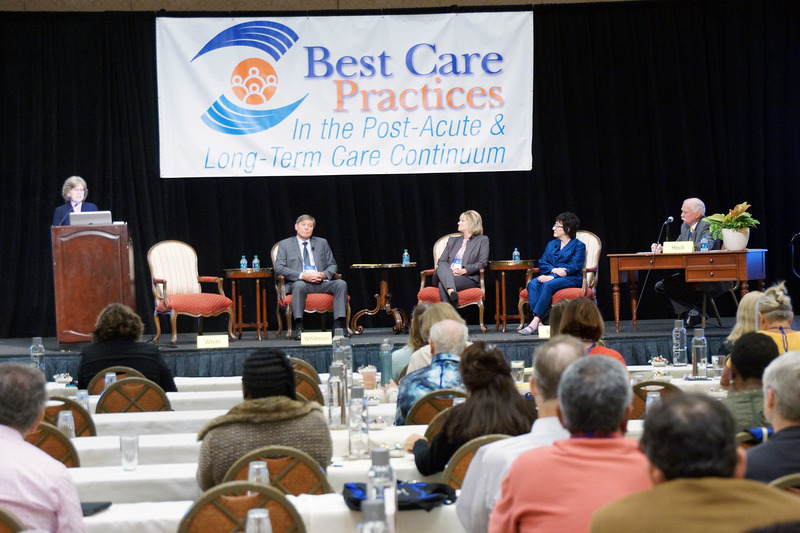 Best Care Practices in the Post-Acute & Long-Term Care Continuum 2018 (BCP) will be held Oct. 11-14, 2018, at Disney’s Grand Floridian Resort, 4401 Floridian Way, Lake Buena Vista, FL 32830. 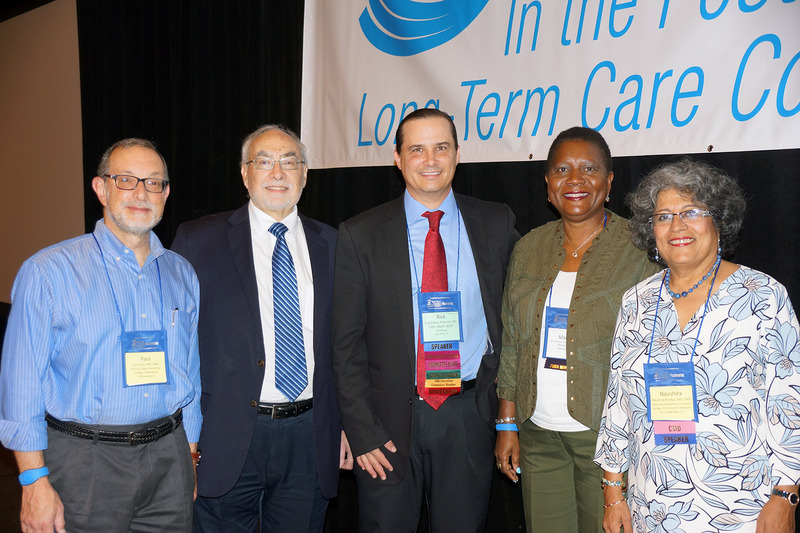 Joint-providership is through AMDA – The Society for Post-Acute and Long-Term Care Medicine and FMDA – The Florida Society for Post-Acute and Long-Term Care Medicine and is planned in collaboration with Florida Chapters of GAPNA, NADONA, and FGS. Best Core Practices 2018 will also feature the 27th Annual Meeting of FMDA. This year, we are featuring medical, nursing, and pharmacist students at a 60-minute session where 4 students have 8- to 12-minutes to deliver TED-like talks on topics related to research, health care delivery, medical/nursing ethics, etc., in the post-acute and long-term care continuum. Submissions should be based on the areas of interest to medical directors, physicians, advanced practice nurses, physician assistants, and pharmacists with issues related to post-acute and long-term care. In addition, the average session is 10- to 15- minutes in length. Quality educational programs are the pinnacle of our annual convention. Attendees expect clinical topics to be strong evidence-based lectures and administrative topics to be relevant to their setting and focused on current best care practices. FMDA has reserved a block of rooms at Disney’s Grand Floridian Resort. The group rate is $252 single/double occupancy; complimentary self-parking; complimentary Wi-Fi service in guest rooms, meeting rooms, and common areas; and no daily resort fee. 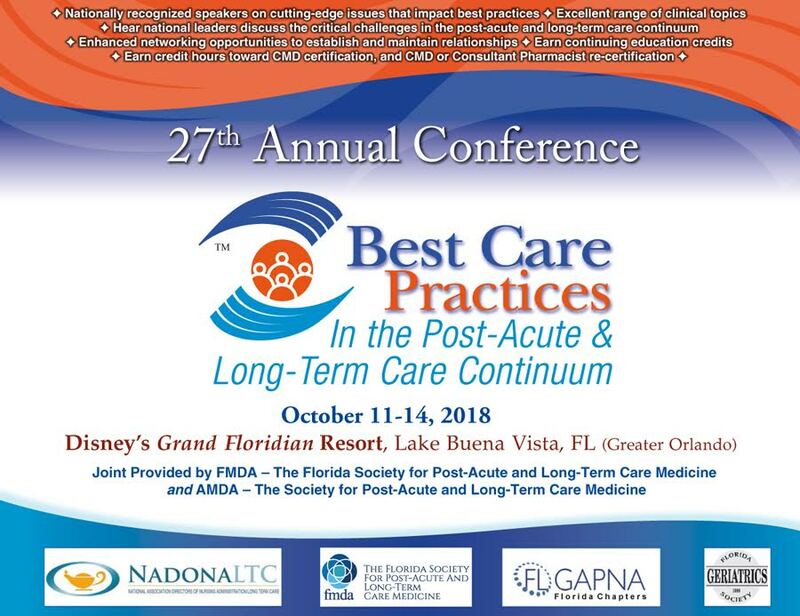 To make a reservation, please call Disney’s Grand Floridian Resort Group Reservations, Phone: (407) 939-4686, and mention you are attending the FMDA’s Best Care Practices in the Post-Acute and Long-Term Care Continuum conference. To guarantee rate and room availability, you must make your reservations no later than Sept. 1, 2018. This special group rate will be applicable three (3) days prior to and three (3) days following the main program dates, subject to availability. Planning on attending this years conference? If you have questions or need assistance, please give us a call (561) 689-6321.